The Cantine Leonardo da Vinci growers continue their philosophy in Montalcinio as well, where they operate the area's only working cooperative. Its winery and vineyards are located in the breathtaking Val di Cava, one of Montalcino's most beautiful areas. Montalcino is particularly prized by winegrowers as its soil has been formed by centuries of accumulated silt and clay sandstone. The Cantine Leonardo Brunello di Montalcino is made from 100% Sangiovese grapes. After being gently pressed, the juice is fermented in 100% stainless steel tanks that are temperature controlled between 72°F and 82°F. Once fermented to dry, the wine is then aged in oak, both small barriques and large casks, for three years to add complexity. 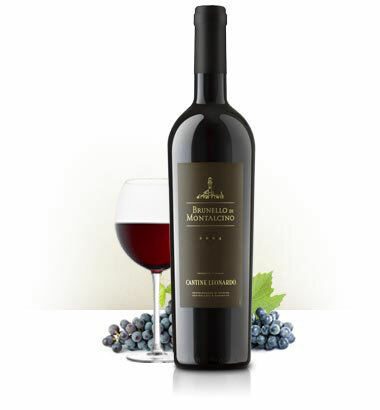 Our Brunello di Montalcino has a bouquet of intense blackberry, black currants and dark cherries. It is a full-bodied wine with a tremendous depth containing rich, dark, ripe fruit jam characters. It has spicy and cedary oak nuances and possesses a well-balanced acidity coupled with a lingering mineral finish.